At SMG, given our panoramic understanding of context and culture, identifying and adapting to specific organisational leadership needs is what we do best. The VUCA world economy demands leaders who can respond creatively to novel challenges. Since inception, we have continually refined and honed our skills, methodologies and processes to ensure our service offering anticipates and meets rapidly changing market needs. 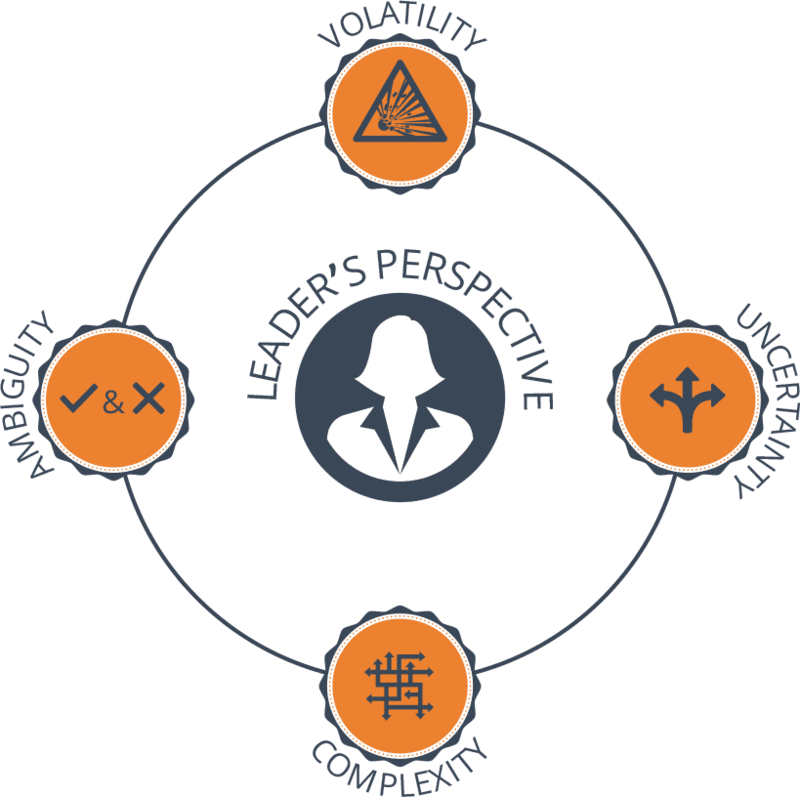 VUCA is an acronym used here to describe or reflect on the volatility, uncertainty, complexity and ambiguity of the general business and market environment typically facing many larger scale enterprises in today’s economy. We partner, we collaborate and we think with our clients in supporting their development strategy. SMG is focused on each individual’s holistic development, enabling participants to grow and develop within their specific work context. Our customised solutions are designed to equip you and your organisation in building futurewise, robust organisations, sharing best practice in global leadership development. We create bespoke executive coaching programs and utilise flexible and novel methodologies, underpinned by modern psychology frameworks to empower you towards maximum personal and professional effectiveness. We offer mentoring in an environment of complete confidentiality, where you, the Executive, are given the opportunity to explore sensitive and key issues in order to gain deeper awareness and understanding. Our customised, cutting edge partnerships and programs are pragmatic, solution-oriented and geared to transform your business at the core. With foundations in team and group effectiveness, effective conversations and dynamics, SMG’s solutions are evidence-based, sound and exceptionally well regarded. Based on decades of experience, we have developed valuable tools to assist leaders and organisations to upgrade organisational culture. This is based on developing leadership capability that can continuously reframe challenges, reinterpret available options and reform operations. At SMG, we believe that by developing leadership strength in our clients, we enable leaders to create a ripple effect of positive change for their teams, clients, business and community. Our commitment is to provide high quality services supported by evidence from organisational and behavioural sciences in order to ensure that our impact goes beyond programmatic approaches and actually creates sustained results. The SMG Academy offers a range of public programs that support the next generation of global leaders at each stage of the leadership life cycle. Our signature leadership development program for women bringing together diverse groups of mid-career and high-potential women to explore contemporary leadership concepts. Participants often remark on the power of being able to talk about specific challenges in a neutral and supportive environment while gaining perspectives from across companies and industries. The impact is the ability to return to their own workplaces with increased confidence and support. Learn how to bring coaching into your every day leadership conversations and get ready to see the capacity that it brings to your team and organisation using the same methods SMG for which SMG has become known. Designed for senior executives and HR professionals seeking to deepen their existing practice of employee coaching. SMG executive presence and impact workshop empower clients to develop an authentic leadership presence. This solution can empower you to develop your confidence and become more influential. Not being heard at meetings, for example, or not engaging effectively with stakeholders, or not speaking persuasively to senior management are some of the most common barriers to career success. Meeting the demands of business today, we deliver customised programs empowering leaders to become confident decision makers for when it really counts. Championing a Speak Up Culture is a developmental pathway for senior leaders wanting to build one of the most important and emerging leadership traits – the ability to cultivate an inclusive culture in which people feel safe to ask questions, take risks, and challenge the status quo. The Stephenson Mansell Group (SMG) is one of Australia’s foremost leadership development organisations, offering clients state-of-the-art programs and business interventions to meet specific leadership and organisational development needs. Our processes embed deep and lasting personal and organisational transformation, resulting in robust, future-wise individuals and organisations.